Upper Kirby is a commercial district in Houston, Texas, United States. It is named after Kirby Drive, so indirectly takes its name from John Henry Kirby. Upper Kirby contains many businesses, including restaurants. Upper Kirby is east of the Greenway Plaza, southwest of Neartown, north of the city of West University Place, and south of River Oaks. Upper Kirby is considered to be in an area west of South Shepherd Drive, east of Buffalo Speedway, north of Bissonnet Street, and south of Westheimer Road. The River Oaks Garden Club Forum of Civics, located in Upper Kirby, is listed in the National Register of Historic Places as the "Forum of Civics" on October 13, 1988. Formerly a county schoolhouse, the building is currently the administrative center for the River Oaks Garden Club. The Texas Legislature created the Harris County Improvement District #3, also known as the Upper Kirby Management District, which governs the Upper Kirby area. In 1999 the Houston city council created the Tax Increment Reinvestment Zone 19, which covers 15 acres (61,000 m2). In 2006 the Upper Kirby district plans to establish a "teen center" at Richmond at Wake Forest geared towards students at Lamar High School, Lanier Middle School, St. John's School, and other Upper Kirby schools and schools near Upper Kirby. Funding issues have delayed establishment of the center. Several businesses are located in the district. The studio for KTRK-TV ABC 13, the ABC station for the Houston area, is located at 3310 Bissonnet Street. Solvay America has its headquarters in the district. cPanel has its office in Upper Kirby. Restaurants Acquisition I, L.L.C., the operator of Black-eyed Pea restaurants in Texas, is headquartered in Upper Kirby. In addition a Pakistan International Airlines booking office is in Suite 805 at 3730 Kirby Drive. CBS Radio Houston which houses KHMX, KILT-AM, KILT-FM, KLOL, KKHH, KIKK, is also located in Upper Kirby. The Borders Bookstore in Upper Kirby opened in 2000. It was the only Borders store within the 610 Loop. It closed on Sunday September 18, 2011. The Upper Kirby Management District is headquartered in Suite 250 in the Upper Kirby District Center at 3015 Richmond Avenue. Upper Kirby is a part of the Houston City Council District C. Upper Kirby also makes up a large portion of Harris County Precinct 139, which is the smallest political subdivision in Texas. The current Precinct Chair of Upper Kirby/River Oaks is Louis Molnar (D), and Mr. Molnar also serves as the Presiding Judge of Precinct 139. The community is within the Houston Police Department's Central Patrol Division, headquartered at 61 Riesner. Two Harris County precincts, 3 and 4, serve sections of Upper Kirby. As of 2008 the precincts are represented by Steve Radack and Jerry Eversole, respectively. Patrol services are contracted to the Harris County Precinct 1 Constable's Office. The Texas Department of Criminal Justice (TDCJ) operates the Houston II Parole Office in Upper Kirby. At one time the Texas Youth Commission Houston District Office was located in Upper Kirby. Upper Kirby is in Texas's 7th congressional district. The United States Postal Service operates the Greenbriar Post Office in Upper Kirby. Katharine Schilcutt of the Houston Press said that the founders of the district desired to "forge a connection with the U.K. based solely on sharing the same initials and installing anachronistic red phone booths on random street corners". The Upper Kirby YMCA Extension is located in Upper Kirby  . Upper Kirby is also home to Levy Park, operated by the City of Houston. Leon Levy gave the land that became Levy Park to the city government in 1941. The Upper Kirby district implemented a two-phase renovation project. The first, completed in 2003, included the installation of a community garden. The event to celebrate the completion of Phase II was held on September 30, 2006. Another $15 million renovation was completed in a two year period, with a grand reopening on February 25, 2017. The park also includes a dog park and a softball field. The park is located in the Greenway Plaza area. 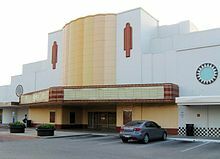 Constructed in 1939, the historic Alabama Theatre was a primary entertainment venue of the district until it was closed and later reopened as a Bookstop bookstore. Barnes & Noble acquired the Bookstop chain and, decades later, closed the story in 2009. The theater is now a Trader Joe's. Most restaurants in Upper Kirby are chain restaurants. Shilcutt said that the restaurants in Upper Kirby were one of the aspects of Upper Kirby that she liked, that "there are some wonderful independent Houston restaurants in the mix, too" and that "while many of the restaurants are some variation on plain Jane American food [...] there's a good variety of ethnic restaurants for the adventurous." The Islamic Society of Greater Houston (ISGH) has its headquarters in the Eastside Main Center in Upper Kirby. Lamar High School, a public secondary school, and St. John's School, an independent K–12 school, are located in Upper Kirby. Residents in Upper Kirby are zoned to schools in the Houston Independent School District. Upper Kirby is divided between Trustee District V, represented by Dianne Johnson as of 2008, and Trustee District VII, represented by Harvin C. Moore as of 2008. Johnson will no longer serve as a board member after 2009. Several elementary schools, including Poe, River Oaks, and West University serve sections of Upper Kirby. Lanier Middle School and Pershing Middle School serve separate sections of Upper Kirby. Pin Oak Middle School is an option for Pershing-zoned residents. All of Upper Kirby is zoned to Lamar High School. The community is served by the Adele B. Looscan Neighborhood Library of Houston Public Library. The current Looscan Branch building opened in September 2007. The former Americans with Disabilities Act non-compliant library, which was established in 1956, closed on August 27, 2005 and was demolished in February 2006. The previous Looscan branch had around 61,000 visitors in the fiscal year 2005. The original plans for Looscan called for the library to get a 5.37 million renovation. An Upper Kirby group proposed a new site near the Upper Kirby YMCA. Around that period the group Friends for Neighborhood Libraries began raising funds. The replacement library, with a cost of $6.2 million, had twice the staff and two and one half times the size of the previous facility. Friends of Neighborhood Libraries had raised one million dollars in four months, and around 2.5 million in total to help fund the new library; the group spent about 30,000 dollars for the expenses. The Jewish Herald-Voice has its offices in Upper Kirby. The River Oaks Examiner is a local newspaper distributed in the community. ^ "Midtown neighborhood in Houston, Texas (TX), 77002, 77004, 77006 subdivision profile - real estate, apartments, condos, homes, community, population, jobs, income, streets". www.city-data.com. Retrieved 24 April 2018. ^ a b c "Harris County Improvement District #3 Archived 2008-10-30 at the Wayback Machine." (see map Archived 2013-04-16 at Archive.today) Upper Kirby. Retrieved on December 10, 2008. ^ a b c d e "Tax Increment Reinvestment Zone - 19 Archived 2008-05-01 at the Wayback Machine." Upper Kirby. Retrieved on December 10, 2008. ^ "The Forum." River Oaks Garden Club. Retrieved on December 11, 2008. ^ "Tax Increment Reinvestment Zone #19 Archived 2008-10-30 at the Wayback Machine." City of Houston. Retrieved on December 10, 2008. ^ Mulvihill, Jim. "Upper Kirby plans flood relief / While residents hope for other projects, funds remain scarce Archived 2007-03-12 at the Wayback Machine." Houston Chronicle. July 27, 2006. ThisWeek 1. ^ "Jobs at ABC13 Archived 2009-10-29 at the Wayback Machine." KTRK-TV. Retrieved on December 10, 2008. ^ "Solvay News & Press Regional contacts Archived 2011-08-08 at the Wayback Machine." Solvay. Retrieved on 5 July 2011. "Solvay America, Inc. 3333 Richmond Avenue Houston TX 77098-3009"
^ "Franchise Tax Certification of Account Status - Texas Comptroller of Public Accounts". Archived from the original on 2012-03-29. "CPANEL, INC. " "Mailing Address 3131 W ALABAMA ST STE 100 HOUSTON, TX 77098-2030"
^ a b c d "District Map Archived 2014-04-07 at WebCite" (Archive). Upper Kirby District. Retrieved on April 7, 2014. ^ "Crowd Pleasers Menu" (Archive). Black-eyed Pea Texas. Retrieved on April 16, 2014. "© 2008 Restaurant Acquisition I, LLC." ^ "Via Certified Mail Return Receipt No. : 7009 0080 0002 2564 9981." (Archive). Liberty Mutual / Wausau Insurance. Retrieved on April 16, 2014. "Restaurants Acquisition I, L.L.C. (d/b/a Black-Eyed Pea)." ^ "Contact Us Archived 2010-09-14 at the Wayback Machine." Pakistan International Airlines. Retrieved on December 10, 2008. ^ Galehouse, Maggie. "Borders on Kirby closes Sunday Archived 2018-04-24 at the Wayback Machine." Houston Chronicle. Friday September 16, 2011. Retrieved on September 29, 2011. ^ "Contact Us Archived 2008-10-30 at the Wayback Machine." Upper Kirby. Retrieved on December 10, 2008. ^ "COUNCIL DISTRICT MAPS > DISTRICT C Archived 2005-11-24 at the Wayback Machine." City of Houston. Retrieved on December 10, 2008. ^ "HCDP.ORG". www.hcdp.org. Archived from the original on 13 March 2016. Retrieved 24 April 2018. ^ "Crime Statistics for Central Patrol Division Archived 2017-10-18 at the Wayback Machine." City of Houston. ^ "VOLUNTEER INITIATIVES PROGRAM - Citizens Offering Police Support Archived 2012-08-26 at the Wayback Machine." City of Houston. ^ a b "Precinct Maps : All Precincts Archived 2009-01-08 at the Wayback Machine." Harris County, Texas. Retrieved on December 10, 2008. ^ "Harris County Precinct 4 Archived 2006-08-08 at the Wayback Machine." Harris County, Texas. Retrieved on December 10, 2008. ^ "Congressional District 7 Archived 2006-04-17 at the Wayback Machine." National Atlas of the United States. Retrieved on December 10, 2008. ^ "Post Office Location - GREENBRIAR Archived 2010-05-09 at the Wayback Machine." United States Postal Service. Retrieved on May 16, 2010. ^ a b Shilcutt, Katharine. "Top 10 Restaurants in Upper Kirby Archived 2012-07-05 at the Wayback Machine." Houston Press. Wednesday March 31, 2010. Retrieved on July 25, 2012. ^ "Our Parks G-N Archived 2010-03-17 at the Wayback Machine." City of Houston. Retrieved on May 7, 2010. ^ a b "Levy Park attracts nearly 7,500 for its grand re-opening". Houston Chronicle. 2017-03-07. Archived from the original on 2017-03-10. Retrieved 2017-03-10. ^ a b "Levy Park Archived 2010-05-30 at the Wayback Machine." City of Houston. Retrieved on May 7, 2010. ^ Foster, Robin. "Bookstop to close Sept. 15; Barnes & Noble opens Sept. 16 Archived 2014-04-11 at the Wayback Machine." Houston Chronicle. August 3, 2009. Neighborhoods >Heights news. Retrieved on April 7, 2014. ^ Kaplan, David. "Trader Joe's to open Friday in the former Alabama Theater Archived 2012-10-23 at the Wayback Machine." Houston Chronicle. September 18, 2012. Retrieved on April 7, 2014. ^ "Locations Archived 2014-05-04 at the Wayback Machine." Islamic Society of Greater Houston. Retrieved on May 3, 2014. "3110 Eastside Street Houston TX 77098" and "Copyright © Islamic Society of Greater Houston. All rights reserved 3110 Eastside Dr, Houston, TX 77098"
^ "Trustee Districts Map Archived 2012-07-11 at the Wayback Machine." Houston Independent School District. Retrieved on November 11, 2008. ^ "HISD TRUSTEE DISTRICT V." Houston Chronicle. October 19, 2009. Retrieved on October 20, 2009. ^ "Poe Elementary School Attendance Zone Archived 2009-02-27 at the Wayback Machine." Houston Independent School District. Retrieved on May 31, 2009. ^ "River Oaks Elementary School Attendance Zone Archived 2007-11-28 at the Wayback Machine." Houston Independent School District. Retrieved on May 31, 2009. ^ "West University Elementary School Attendance Zone Archived 2012-06-17 at the Wayback Machine." Houston Independent School District. Retrieved on May 31, 2009. ^ "Lanier Middle School Attendance Zone Archived 2008-04-11 at the Wayback Machine." Houston Independent School District. Retrieved on May 31, 2009. ^ "Pershing Middle School Attendance Zone Archived 2008-04-11 at the Wayback Machine." Houston Independent School District. Retrieved on May 31, 2009. ^ "Pin Oak Middle School." The Southwest District. Houston Independent School District. February 14, 2002. Retrieved on May 31, 2009. ^ "Lamar High School Attendance Zone Archived 2011-09-28 at the Wayback Machine." Houston Independent School District. Retrieved on May 31, 2009. ^ a b Downing, Margaret. "Judging Books and Their Covers." Houston Press. August 21, 2007. 1 Archived 2011-06-15 at the Wayback Machine. Retrieved on August 11, 2009. ^ "Adele B. Looscan Branch Replacement Archived 2007-08-12 at the Wayback Machine," Houston Public Library. Retrieved May 23, 2008. ^ Downing, Margaret. "Judging Books and Their Covers." Houston Press. August 21, 2007. 2 Archived 2008-08-30 at the Wayback Machine. Retrieved on August 11, 2009. ^ "Contact Us Archived 2014-02-08 at the Wayback Machine." Jewish Herald-Voice. Retrieved on April 7, 2014. "Delivery: 3403 Audley St. Houston, TX 77098"
^ "About Us." Examiner News. This page was last edited on 25 July 2018, at 20:16 (UTC).